How do you use PMD Editor in MikuMikuDance 7.39? How can you add parts to your MMD models? How can you make new models for MikuMikuDance 7.39? Use PMDE to make a new model! You may think adding parts in PMDEditor is out of your reach, but it’s easier than you think! Open up PMDEditor, then go into PMDView, which is the large window where the model shows up. Go into the View tab, then select Vert/Material. A window should pop up. Select MA. Your model’s layers will appear here. Now go into the View tab again and select Obj Controls. Another window should pop up with Z, Y, and X on it. These are the controls you will use to move the different parts of the model. Editor’s note: No need to convert a RAR into a ZIP file. An excellent method for opening Japanese files is outlined in this article on LearnMMD: Bandizip keeps Japanese file names intact. Unzip the file and copy everything in there. It doesn’t matter if it’s the model, the textures, or the .sph files. Copy it all! Then, in a separate window, make a folder for your model. 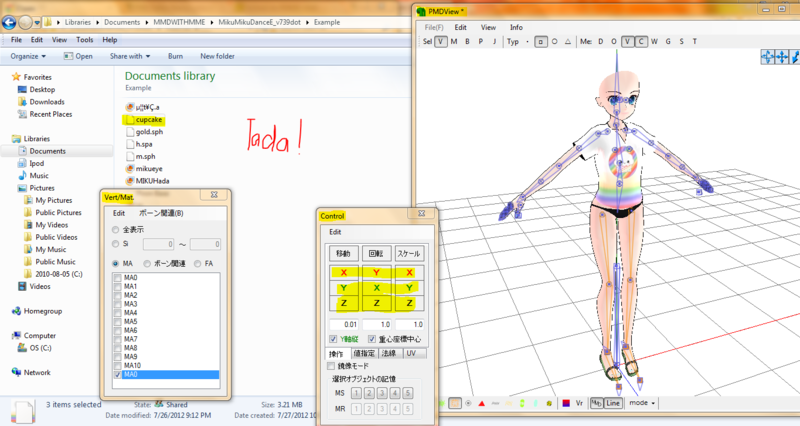 Name it “First MMD Model”. Then, go into it and paste all the model stuff! Unzip that file and choose a shirt. I’m choosing the Chibi Food Cupcake shirt. Copy its files into the new model’s folder. Have you got the folder up? Great! Now open up PMDView over that. Drag your clothing item to the PMDView window. A box should pop up. Select “Ad” and then “Ok”. The clothing item will pop up on the model!!! Often, the item will not fit right. How do you move it? The answer is the Vert/Material window we talked about earlier. MA0 will be at the beginning. Scroll down until you see another MA0. Select that and anything below it. Left click and drag your mouse. A box should be forming over your clothing item. When your item is completely inside the square, let go of the mouse. Your item should be orange! Use the arrows and the Object Controls window to get it fitted. Now save the model. Congratulations! You have made your first model! Keep practicing, and you’ll get even better! I have added ears for a model and it’s messed up. You’ll have to fix those ears’ weighting. Can you guys do a tutorial for PMX editor? I’m using 0.2.2.2.t.0 which don’t have the same controls. For some reason whenever I add something it glitches out and flies everywhere?? How do I fix that..? There are plenty of ways to botch a model, and it’s hard to tell what’s wrong with yours if *you* don’t tell us. From the sound of it looks like physics are messed somehow… but since you have the model and we don’t, you are better suited than anyone else to solve the mystery. So I have this issue, I’ve added parts to a specific base, however when I went into transform to test the model, parts of the base glitch out when the model was being moved. It looked like someone had grabbed a section of torso and stretched it out. How do I fix this? Should I just delete the area glitching or is there a better way? Aparently part of your model got misweighted to wrong bones. You will have to set it back. How do you make parts fit a specific model? Sometimes parts aren’t built for a certain base and resizing still leaves you with clipping. I encountered this problem in the past and would like to know what to do in this case. In addition to what KillerBeer offered, you can always delete the skin that lays underneath the clothing. This is the fastest way to get a good resize– don’t worry about anything but the rim! Especially when the cause is physics and weights. Other times, you can use the transform window to bend and scale a piece of clothing. Check out https://learnmmd.com/http:/learnmmd.com/pmxe-transform-window/ . You can get away with fitting one part, then fitting the next. Uhh I don’t know what I’m doing wrong I looked through all of the past comments for a similar problem and I tried different things to see if that would fix it but nothing worked so I decided to comment on it if someone could help. Whenever I try to put clothes on a base it turns skin colored, can I have some help? I think that https://learnmmd.com/http:/learnmmd.com/two-pmxe-common-problems/ could be of some use. Read about the “white model” problem there. I downloaded the mmd base but it wont show up when i open the pdm editer… im really sad and confused can someone help please? Hi Jenny! Any time you run into a problem, it’s worth exploring the problem a little bit. Can you open a different base? Can you open anything? Are there are any error messages that pop up? Some bases might be up that are just plain broken. Or, you might not know how to open a file. Or, you might be missing some of the files that the editor relies on. 2) From the main menu, select file->open. 4) Find Miku_Hatsune.pmd in the list and double click it to open. Erm… file->open would open a saved .pmm project file, not a model. To load a model, use the model manipulation panel below. Umm… Bandages did said to open it in the “Editor”….. Question: I’m making my OC, and I fit all the clothes onto a base perfectly. When I save it as a pmx file, load it into MMD, it’s still fine. But the only physics/bones left are on the base. There’s no longer bones attached to the hair, skirt, not anything. Help please? Well, contrarily to the article’s title, assembling a model from parts *is* tricky business, unless most of parts are really primitive, and it has lots of underwater rocks to bump on. Make sure you read more articles on it before you attempt some of the advanced stuff. Whenever a put jeans on a model they always glitch through the legs when they dance. Same thing with shirts and jackets. Help? Does the stray vertex move or stay when you move the shoulder bone? Try to move the model in PMXE’s Transform window and see if you can catch it there. Or simply shuffle through every bone of the model in weighting mode and wait for a red dot appearing where it shouldn’t. Various translated versions of PMDE have different denominations for buttons, which may be confusing (and the interface itself became more complex since times when screenshots for this article were taken), but yes, it’s “vertex and masking” panel you’re looking for (you can find it by pressing F3 from PMDView window). As for MA-with-numbers, these are not “buttons” but a list of materials present in models, and their names can change from model to model (it’d be nice if they were named after bodyparts they represent, but no modelmaker ever bothered to set a trend). ok, so MA0 would say material 0 right? It’s formally right but essentially wrong :D. Both MA0 and Material0 are simply names given to materials arbitrarily, and more likely than not materials in the model you’re working with will be named in different order that the one the tutorial uses as an illustration. You should look not at a *name* of the material (unless you heed personal instructions to a particular model) but search for a material that contains the *bodypart* you want to work with – the picture above should give you a hint. You can’t change clothes on a model as they are its integral part (well, technically, there *is* a way, but it’s way more difficult than it’s worth the trouble for most cases). It is much easier to have two differently clothed models and substitute them on the fly. As for the second question, try to adjust “over Nth accessory described after models” field in “Menu->Background->Accessories edit” command. Okay, so I’m really confused. I have the English limited edition of PMDE, and the latest version of MMD. I load everything into my model’s folder, fit them into the model, and everything looks okay in PMDE. However, when I save the model and load it into MMD, the textures are white. Here’s my problem: The textures aren’t in Japanese, and I t’s not caused by the files being PNG. I’ve looked and searched everywhere, but I have no idea how to fix this problem. Also, whenever I load a shirt or other model after something. is already loaded, the textures won’t load for it, nor can I get them to work correctly. I’ve tried so many different textures, but all of them come out as white. Check your texture file names and see if they are longer than 10 characters (including the extension). If so, rename them and change the model accordingly. That’s not the problem either, but thanks anyways. Then it’s hard to tell anything without seeing the problem in action. Perhaps you might pack your model and textures into an archive and upload it somewhere so that we could check it for ourselves. I tried tons of different hairs, shirts, pants and shoes but everything is white and i went into the folders and everything still has its textures. What do you mean “went into the folders”? If you’re assembling parts into a single model, textures from all parts must be placed into the same folder, the one where model’s .pmd file resides. Copy texture files into the folder with model’s .pmd file. Are texture filenames longer than 10 symbols?